This is not a simple fairy tale. This is a story designed to control young girls. The moral – stay on the path, or else you will get hurt. This is victim blaming at the core. 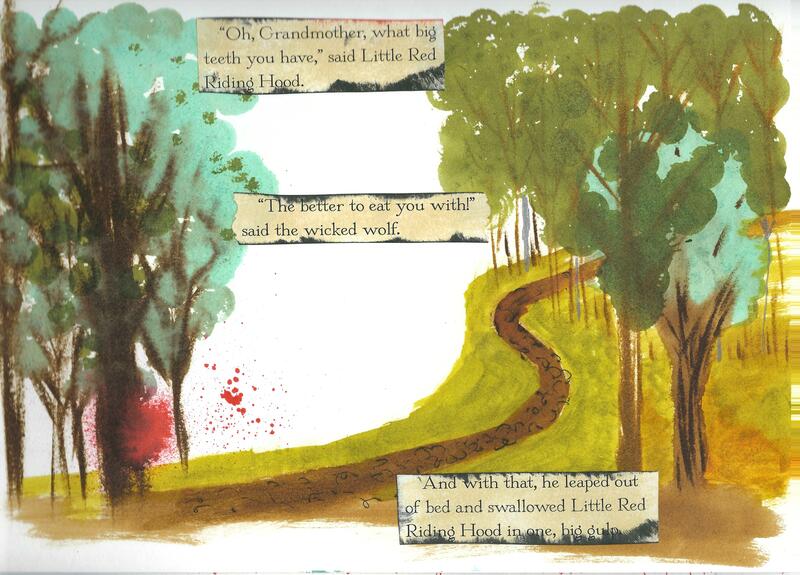 It teaches that it is Little Red Riding Hood’s fault that she and her grandmother got eaten by the wolf. The wolf is every single male she ever encounters in her life. The “being eaten” is everything from getting a lesser job to getting raped or killed. This story teaches girls – and only girls – that if we don’t stay in our defined roles then we deserve everything bad that happens to us. Notice she isn’t even named. Her “name” is what she wears – exterior only. She isn’t even real, just a placeholder. She isn’t a person, but a thing. People look at her outside only. Notice that it is a strong male who saves her – the hunter comes by and hears the grandmother snoring and decides to investigate. Why is snoring loudly seen as a sign that something is wrong? Do women not snore? Are we expected to maintain control over ourselves at all times – even while unconscious? Notice that the townspeople don’t send the hunters into the forest to clear it of dangerous animals. They don’t make it safe for her or others. Art made on a Strathmore art journal – mixed media paper, using various pens and painted using Distress Ink. 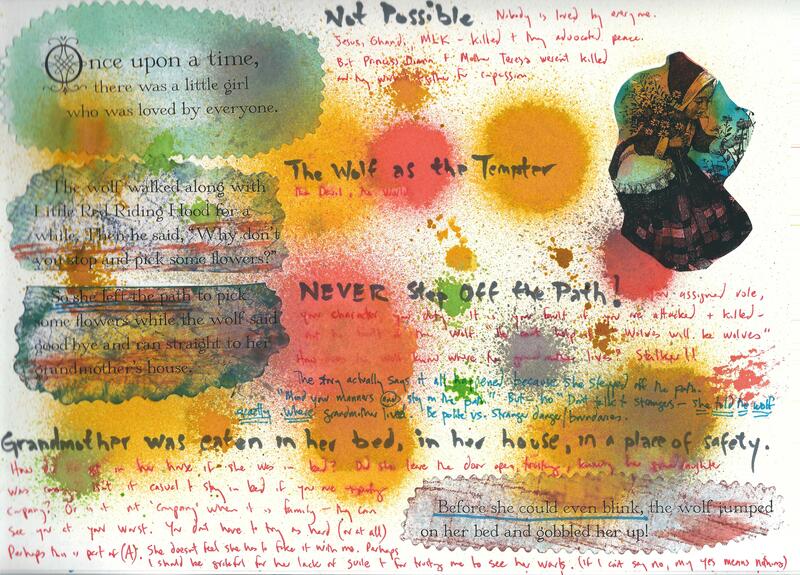 Words are photocopied from a book about Little Red Riding Hood and then dyed/stamped/inked. This entry was posted in art journal, Artwork, gender violence, Women's issues and tagged Distress products, fairy tales, little red riding hood. Bookmark the permalink.